Paul, during his final imprisonment, writes Timothy (2 Timothy 1:13–14), urging him to keep the pattern of sound teaching he had heard from Paul. But this is not just an emotional farewell. The content of the gospel and the pattern of Paul’s teaching is not going to end with the martyrdom of Paul. The church needs to continue to hold to that truth. Understand the pattern of sound teaching. Keep what you have heard. Pay attention to what you have heard. Hold onto the apostolic teaching. There is substance to the gospel! Union with Christ is at the heart of what you have heard, 2 Timothy 2:11-13. Keep what you have heard in faith in Christ Jesus. What you believe can never be simply abstract, academic doctrine. It is faith that focuses on Christ. Keep it in love because of Christ’s work. How you keep the truth is no less important than the fact that you are keeping the truth. In Deuteronomy 4 Moses is summarizing the revelation God had given to Israel. Knowing that he was not going to enter the promised land with them, he is calling them to teach their children. They needed to know who God is and what he had done for them. Moses had led in a song of triumph after God delivered his people through the sea, Exodus 15. Moses was about put another confession of faith into song in Deuteronomy 32. God’s people must not be ignorant of who he is. The apostolic message forms a pattern of sound words. This teaching forms a pattern (similar to building plans!). This pattern is sound, healthy, or health-giving. We use the expression, “sound in mind and body.” The sound pattern is contrasted with false teaching, which is often directionless, Ephesians 4:14. Confessions grow up in opposition to false teaching. They serve to separate the true church from falsehood. The early church began to formulate confessional statements in opposition to Arianism and other heresies. A confession serves to unite the church. It is what we together believe. For the Orthodox Presbyterian Church that summary, that confession, is found in the Westminster Confession of Faith and Larger and Shorter Catechisms. The Westminster Shorter Catechism (and other confessional statements) are subordinate to the Word of God. The Westminster standards were produced in 1643-1647 as a summary of the teaching of Scripture. “As Paul wrote from prison to his protégé, Timothy, his mind was focused on how the church was to manage once he and the other apostles had passed from the scene. His answer had two components: a structure in which the governance of the church was put in the hands of ordinary but faithful men, and a form of sound words. Both were necessary. Without structure, the church would have no leadership; without a form of sound words, she would drift from her theological moorings, losing touch with her past and with other congregations in the present. A form of sound words, a confession, was crucial for maintaining both continuity with the apostles and unity among Christians in the present. And that is what our confessional documents do today: they bind us to faithful brothers and sisters in the past and with the same in the present.” (Carl Trueman, “Why Christians Need Confessions,” New Horizons, February 2013). Live through the Holy Spirit who lives in you. The Holy Spirit lives in you. Without him you could not come to Christ. You would not even want to. 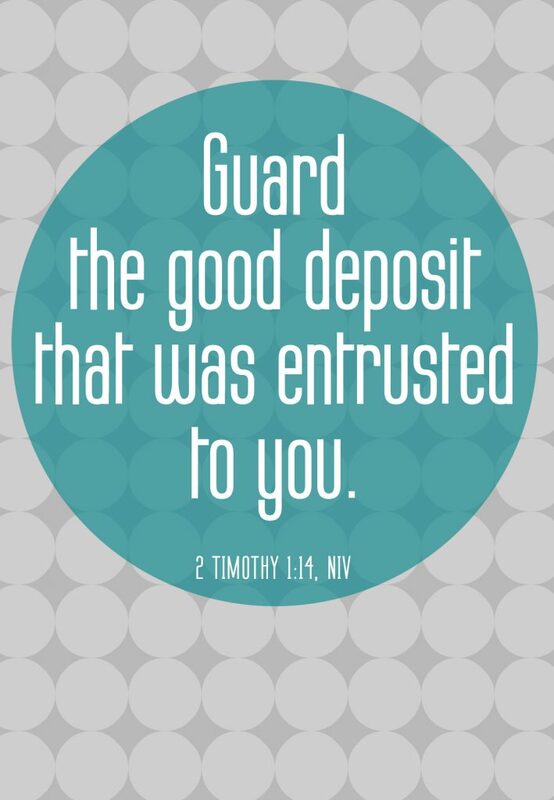 He enables you to guard what you have received. This guarding involves not only rejecting error. It also means living a life that is faithful to the Lord, even though you face difficulty and suffering as a result. Onesiphorus is a specific example of one who has been faithful, unashamed of Paul’s chains, and has refreshed Paul. Paul looks forward to “that Day,” not only for himself, but also for his dear friend. The Spirit enables you to live in faith and love, verse 13. Keep what you have heard as the pattern of health-giving teaching. Guard it, and, in turn, pass it on.